Christmas 2018 is full of exciting gifts for your family and friends! This year, put a new twist on your gift-giving and make an impact on your customers and employees with holiday gift cards! After all, who doesn’t love a juicy, charbroiled steak delivered right to their front door? The gift of steak shows your kindness and appreciation to the ones who mean the most to you. 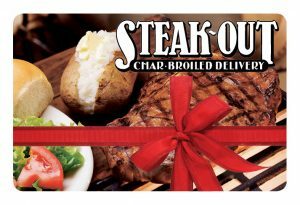 Though not a new concept, Steak-Out Charbroiled Delivery holiday gift cards stand alone when it comes to holiday gifts. Our superior meal delivery service has been providing USDA graded, hand-cut and perfectly-seared steaks to our loyal customers for over 30 years. Let us delight your friends and family this holiday season with a gift that fits every box and budget! Many gift card purchases require a visit to a shop or restaurant, and then often involve excessive table wait times and other issues that can arise with dining out. However, Steak-Out changes the game yet again! Our meal delivery service allows you to easily place your order online, relax while our team cooks your meal to perfection and then delivers it straight to your door. If you’re having a holiday party, we’ve got that covered too! Simply place individual orders from our online ordering system, and we’ll take it from there. When you gift your friends and family with one (or more) of our gift cards, you’re providing the simplistic meal delivery approach that offers mouth-watering steaks in the comfort of the home. In addition to our high-quality steak selections, we also offer a myriad of other menu choices, including juicy burgers, signature sandwiches, kid’s meals, charbroiled chicken breasts and tender seafood. For the vegetarians in your group, we also offer large piping hot baked potatoes and crisp salads. Don’t forget our mouth-watering desserts: rich Death-by-Chocolate Cake, creamy New York Style Cheesecake and fresh baked cookies. Have questions about the nutritional value of our meals? No need to worry! Because we know that diets can be strict, especially when potential allergens need to be avoided, we offer a nutritional chart on our website that includes details such as saturated fats, carbohydrates, calories, fiber, sodium and protein. Our team of highly-trained cooks understand the importance and severity of allergens. Simply request a substitution or elimination during the ordering process and let us know what your allergies are so that we can be sure to avoid those items when preparing your meals. Steak-Out Charbroiled Delivery offers a one-of-a-kind catering and delivery service throughout the Southeast and Midwest. Each location offers our signature staples plus regional favorites to suit your palate. Our holiday gift cards are the perfect way to say, “Thank you,” or “Happy Holidays,” to your friends and family. Purchase as many or as few gift cards this holiday season and get your shopping done early! This simple yet pleasing gift brings the highest quality steaks, sides and desserts straight to the door of your loved ones. Order online for a quick one-stop shopping experience from your couch using your computer, tablet or phone!